The UK’s history of embracing technology and innovation means its capital is well placed to benefit from the “fourth industrial revolution”, the Chief Executive of Microsoft UK has said. Cindy Rose (above) was “optimistic” about how artificial intelligence, machine learning and cloud computing could change people’s lives for the better. However, she added it was important that governments and companies work together to ensure that “no one is left behind” as technology changes how people live and work. 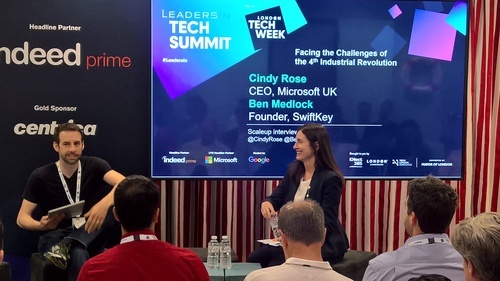 Cindy Rose, Microsoft UK CEO, and Ben Medlock, SwiftKey founder, talk about the fourth industrial revolution and AI. “There is a real opportunity for the UK to embrace technology and accelerate economic growth,” Rose told an audience of tech experts and media at Google’s offices during a LeadersIn Tech summit event for London Tech Week. 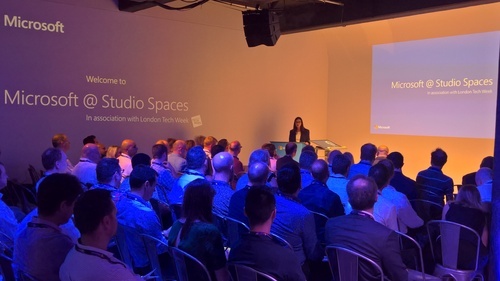 Microsoft, which was a headline partner for London Tech Week, has regularly talked about how society is undergoing a radical shift as companies and consumers embrace new technology – the fourth industrial revolution. Autonomous vehicles, robotics, 3D printing, genetic diagnostics, the Internet of Things and blockchain are just some of the innovations that are changing workplaces and homes. Microsoft is at the forefront of new technology in the UK, running a cutting-edge research lab in Cambridge, helping start-ups via its Venture and Accelerator projects, and unearthing the next generation of developers through its Imagine Cup competition. Rose – who was joined at the event by SwiftKey co-founder Ben Medlock – said Microsoft is using its knowledge to work with firms to help them thrive in the 21st century. Cindy Rose speaks at London Tech Week. Microsoft has been involved in AI “for a while now”, Rose said, citing Bill Gates’ vision nearly 25 years ago of computers that can see, listen and learn. Rose also highlighted examples of AI in Microsoft offerings today. Presentation Translator, she said, is a PowerPoint add-in that brings real-time subtitles to presentations using Microsoft PowerPoint. Subtitles can be shown in the presenter’s language (to support accessibility scenarios) or in any of the 60-plus supported languages provided by Microsoft Translator. Through this AI-empowered feature, the audience can use their own device to follow what the presenter says, in their preferred language. However, as Microsoft’s experience and knowledge has grown, so too has the amount of data that is now produced by the huge numbers of connected devices people use. According to Deloitte, 81% of UK adults and 91% of 18 to 44 year olds own a smartphone. All that information is only useful when AI and cloud computing work together to decipher it. One example was InnerEye, a Microsoft project that uses AI to build image analysis tools to help doctors treat diseases such as cancer in a more targeted and effective way. As such, technology has the potential to substantially improve people’s lives and, in the case of InnerEye, even save them. But Rose added that those in power need to be vigilant against the flip side of the fourth industrial revolution and the impact it will have on some jobs. “We are optimistic about the role of AI in people’s lives,” she said. “At the same time we realise there will be unintended consequences so we have a responsibility to ensure the benefits and opportunities flow to everyone. We are trying to be thoughtful about the issues that AI raises, and engage with governments and partners to shape how this technology is developed and deployed. We need collaboration between governments, businesses and people to make sure everyone is ready for this new world. One of the most effective ways to prepare the UK for the fourth industrial revolution is to make sure people have the digital skills required to get the jobs they want. According to Cathy N Davidson, a professor at Duke University and co-director of the annual MacArthur Foundation Digital Media and Learning Competitions, “65% of children entering grade school this year will end up working in careers that haven’t even been invented yet”. Rose stated that encouraging and supporting people to learn new skills is a priority for her and Microsoft, noting that the company launched a programme earlier this year to make digital skills available to people across the UK to ensure the country remains one of the global leaders in cloud computing, artificial intelligence and other next-generation technologies. Microsoft will train 30,000 public servants for free in a range of digital skills; make sure everyone in the UK has access to free; online digital literacy training, launch a Cloud Skills Initiative, which will train 500,000 people in the UK in advanced cloud technology skills by 2020; and recruit an extra 30,000 digital apprentices through its own programme for its network of 25,000 partners in the UK. Why is London's startup scene the best in the world, bettering Silicon Valley, New York City, Tel Aviv and Beijing? Aoife Geary from Jobbio explains. The global startup ecosystem is booming right now. Parents of Tech: Can You Have Kids and Be a Tech Leader? Is it possible to have a full-time job in tech and have children? What is a Usability Lab? Neil Dodd from BGL Group explains. Mobile M-Commerce in the UK - How Can We Win This Over? How can the UK lead the world in M-Commerce? Can AI Be Emotionally Intelligent? Ai is incredible and can do things humans can't. But can it be emotional? The Internet of Things, Blockchain and other drastic digital disruptors are already making big waves in the energy sector. 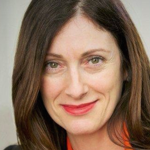 The UK's history of embracing technology and innovation means its capital is well placed to benefit from the "fourth industrial revolution," says Microsoft UK CEO Cindy Rose. Rendermedia's Mark Miles looks at how technology is changing the way we view content.